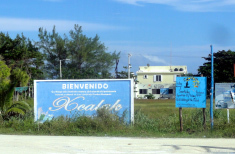 I get a lot of questions and emails about places to stay in Xcalak, as well as here in Mahahual. I don’t know much about Xcalak except Costa de Cocos, and not much about the other hotels and resorts. Jean Wylie one of our local residents told me about this place in Xcalak, that her friends have just bought and opened. She told me it was real nice, and she sent me a link to their website. She also helps out there sometimes I think. 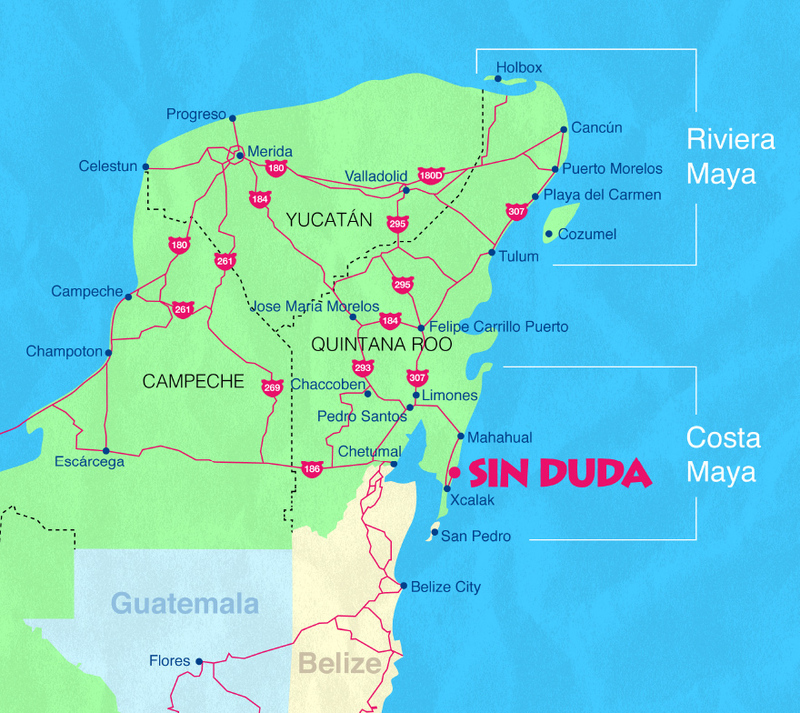 I have not been there yet, but I plan on a visit soon to Sin Duda Villas in Xcalak. I had planned on going last weekend, but my plans got changed. So until then, I am going to share some information from their website. 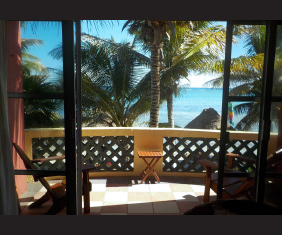 Sin Duda Villas awaits you on the Costa Maya. The Xcalak Peninsula at the frontier of Belize. Swimming and snorkeling are amazing directly from our white sand beach. The Mesoamerican Reef, just offshore, creates an incredible personal aquarium. Simply don your fins and masks to swim only 100 feet to the first of hundreds of coral heads. We are located within the boundaries of El Parque Nacional Arrecifes de Xcalak, which provides a protected habitat for myriad species of fish, sea creatures, and colourful corals. In syncopation with nature, and with your delight and comfort in mind, we present a choice of seven unique spaces that are exquisitely off the grid: 3 double rooms with shared kitchen, 2 full apartments, and 2 jungle studios nestled in the almond trees. Using ecologically responsible technologies, and a cheerful perspective on conserving our unique environment, we invite you to share this life with us. Appreciate living in concert with Mother Nature as we move through seasons leaving only our footprints behind in the white Caribbean sand. 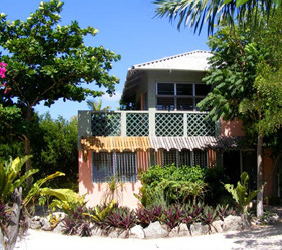 Sin Duda Villas was designed by the former owner and architect, Robert Schneider. The buildings reflect his appreciation and love of Mayan simplicity, form and colour, with a bit of whimsy tossed in here and there. Once you’ve come to stay with us at the end of the road, where the stars cast shadows when the lights go out, you will return again and again. 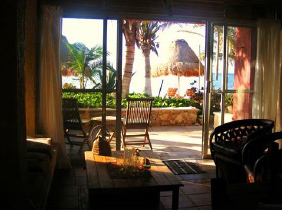 Sin Duda Villas offers individual rooms, full apartments, and studio apartments. 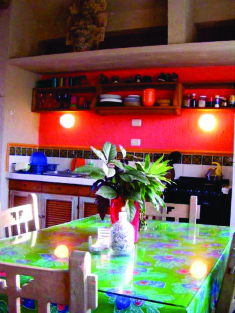 Each room is unique, splashed with brightly coloured walls, inlaid tiles, and inviting private nooks. A pleasant combination of whimsy mixed with traditional Mayan shapes. Enjoy the jungle green gardens, local handcrafted furniture, elegant columns, jungle hardwood for dappled shade, gravity water-flow for showers and sinks, pure white beach naturally available. Uniquely original, every space! Each room has its own patio or balcony with comfy handcrafted Muskoka chairs for seating. On the rooftop, two star-decks await, one with Muskoka chairs, the other with wooden chaises for tanning “au natural”, UFO-watching and celestial viewing on starry nights. 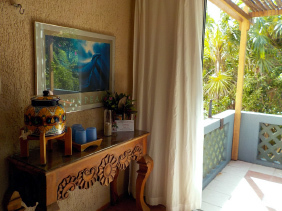 #2 Patio Room (Ground Floor) – Double RoomRight beside the beach, an airy shaded room featuring Mexican masks and hacienda pieces. Open the sliding doors and step through the fresh cotton curtains to your patio. At the edge of your little garden, 2 Muskoka chairs await under the columned palapa-covered patio. Accommodates 2 people with a comfy Queen-sized bed. A hidden trundle bed can be pulled out for 1 more. #4 Ocean Room (Second Floor) – Double RoomA favorite. This is a sun-dappled double room with a beautiful ocean view. Bright tropical colours with some beach-treasure furniture fill this room. Breezes gently blow through the white cotton curtains. 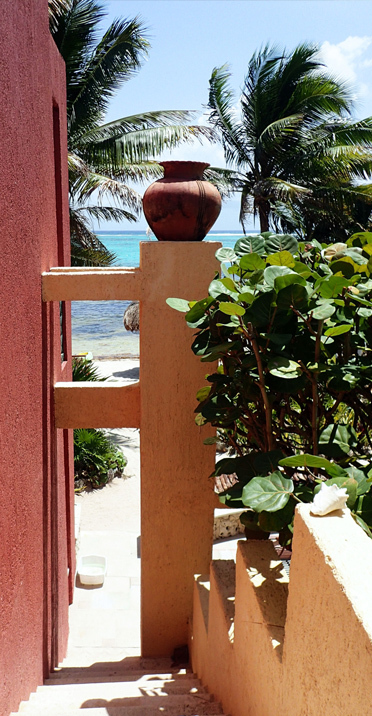 Enjoy the beach from the private balcony just for two, shaded by bahareque, which is made from peeled wooden poles that are collected just after the full moon – the Mayan way. Accommodates 2 people with a comfy Queen-sized bed. 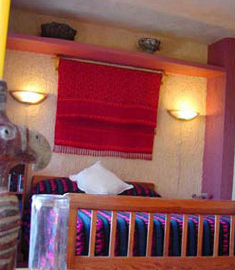 #5 Laguna Room (Second Floor) – Double RoomOur most spacious double room with hacienda furniture and collected art pieces. Laguna offers a choice of sleeping arrangements – a roomy King bed or 2 twins. Enjoy the ocean view from the balcony from either the hammock or 2 Muskoka chairs. Perfect for bird watching too. 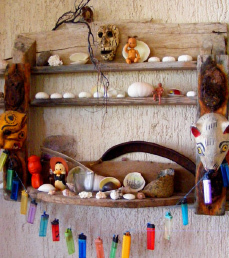 The balcony is shaded by bahareque, which is made from peeled wooden poles collected just after the full moon – the Mayan way. Accommodates up to 2 people. #6 Studio Selva (Second Floor, Separate Building)Studio Selva means Jungle Studio. 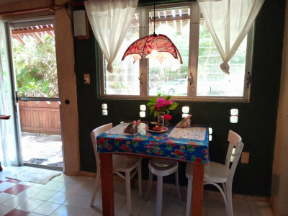 Studio Selva is a separate studio, an adult tree-house, just a pathway from the beach. This is our treehouse for big kids. Amidst art and whimsy, you’ll have your own private retreat among the tree tops. Especially popular for its privacy, you’ll have 360 degree views of jungle, glimpses of the Caribbean through almond trees, and behind you, Laguna Santa Julia. This special suite offers an efficiently designed kitchen with fridge, and living/dining room. A balcony in the treetops with table and chairs for morning coffee and evening cocktails. The balcony offers wonderful bird watching opportunities on their level. The cute bathroom is surrounded by verdant jungle. Enjoy your privacy or mingle, if you wish, but always, indulge! Accommodates 2 people. #7 Bailando Apartment (Ground Floor)Bailando means “Dancing”. This is an airy open space, designed for optimal efficiency. Through sliding glass/screen doors, a large beach-front deck under the palms. This apartment has a master bedroom, separated by wood louvres, with a queen bed, and hidden trundle bed that can be pulled out for one more. The louvres can be closed for privacy. 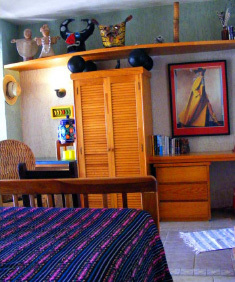 The dining table and chairs were hand carved by a Merida craftsman. In the living room is the surprise of a Swedish-crafted double wall-bed that can be pulled down. Devilish art, full bookshelves, plus plump pillows on a comfy built-in banco for gatherings. Featuring a full kitchen with shelves stocked with accoutrements for preparing snacks and meals. From your deck, step right onto the beach. The Caribbean Sea is right there! Accommodates 2 to 5 people. #8 Querencia Apartment (Second Floor)Querencia means “Chosen Place”. Enjoy soaring views of the Caribbean from the balcony of this spacious apartment. You’ll find art in special niches and full bookshelves. Querencia has a master bedroom, separated by wooden louvres, with a queen-sized bed, and a hidden trundle bed that can be pulled out for one more. 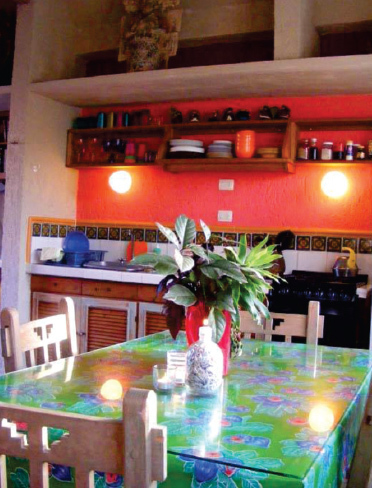 The dining table and chairs were handcrafted in Merida. In the living room is the surprise of a Swedish-crafted double wall-bed that can be pulled down, full bookshelves, and a comfy built-in banco with plump pillows. Featuring a full kitchen with shelves stocked with accoutrements for preparing snacks and meals. From the wide balcony, the Caribbean is at your feet. Accommodates 2 to 5 people. Maya Cocina and Library (Second Floor)In keeping with our low-impact lifestyle, we offer “space-sharing” to protect our balanced energies. A fun kitchen with stove/oven and refrigerator. This room is for use of guests in our 3 double rooms without the added cost of a kitchen for each. It is accessible 24 hours. The Library surrounding this traditional and vibrant space, has hundreds of books. Settle into comfortable wicker furniture, under a high vaulted ceiling and carved beams. These beams are gifts from a Mayan elder. Also enjoy the “old-school” games, jigsaw puzzles, and New York Times crosswords. We invite you to relax and make yourself at home. This cozy gathering place is our guests’ favourite space. 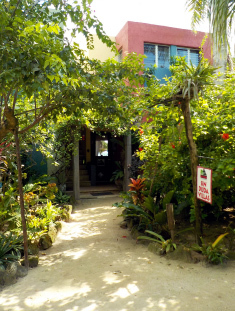 Casita Baja (Ground floor, Separate Building)Studio apartment available by appointment. The Little House Below. Reserved for those needing their own space to work or just to be, without interruption. Comfy double bed, compact kitchen/dining, mini bath/shower, with sun-filled living room/office for inspiration. Casita Baja designed for 1 or 2. Welcome to Sin Duda Villas! A popular tourist destination known for beaches, resorts, and energetic night life. Cancun has modern architecture, shopping malls, night clubs, and restaurants. Shop at Costco, Commercial Mexicana, Walmart and Las Americas Mall. 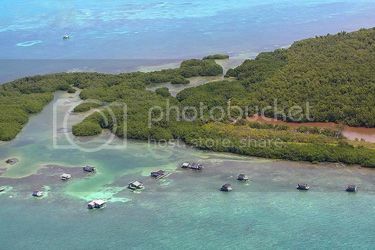 A quaint and authentic fishing village only 20 minutes South of the Cancun airport. We recommend this as an overnight if you arrive into Cancun late in the day, or have an early morning departure. The town is small, friendly and easy to navigate. The road from the highway leads you right to the traditional town-square bordered by a large church and several nice restaurants. Playa del Carmen is a busy tourist destination with all amenities. Playa del Carmen was once a simple fishing village, with a boat dock that offered ferry service to Cozumel. It has evolved into a lively cosmopolitan city with the fastest urban development rate in Mexico. 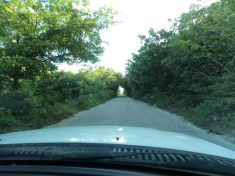 A fast-growing trendy tourist destination, within 30 miles of the Coba Archaeological Zone. Hwy #307 goes right through the centre of the puebla where there are restaurants and gift shops galore. The beach at Tulum is spectacular and goes for miles. Shop for groceries at San Francisco or Chedraui. These are the last large grocery stores you’ll find on your drive here. Felipe Carrillo Puerto is a Mayan city and has historical significance because it was rebel headquarters for the Caste Wars of the Yucatan. In town you will find a Pemex gas station and the last ATM machine (at gas station) before Xcalak. Colonial elegance, shady avenues lined with mansions, museums and markets. Merida was created by the Mayans in the 3rd Century, and rebuilt in the 16th Century by the Spanish. An enchanting place of art, history, ancient landscapes, and pyramids along the nearby Ruta Maya. Merida is the best city from which to coordinate visits to Mayan Archaeological sites. Chetumal is the capital city of our state of Quintana Roo, three hours South of Sin Duda Villas, and within range for a day-trip. Swathed in Central American floral humidity, Chetumal has not yet focused on tourism. Enjoy the Plaza Las Americas mall with an 11 screen cineplex theatre. Shop at Sam’s Club, Walmart, Chedraui, and more. Drive South on Hwy 307. 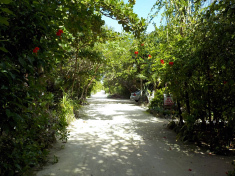 Cancun to Playa del Carmen to Tulum Puebla is a 4-lane corridor with access to beach resorts. One hour on 3-lane road, Hwy 307. This is the junction of Hwy 184 (from Merida) and Hwy 307 (from Cancun). Follow Hwy #307 through the town. Continue for 45 minutes South on Hwy 307, to the village of Limones. Just beyond the village, at the last tope, are excellent fruit and honey stands. Distance from Limones to Cafetal is 2 km. 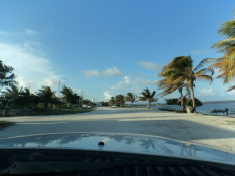 At Cafetal, there is a wide left-hand turn to the road that heads East, towards the sea and Mahahual, the cruise ship port of the Costa Maya. A wide highway with wide shoulders. The Xcalak road is at km 51. It is a right hand turn and the road heads South. Watch for the homemade signs on the corner. Just beyond km 51 and the Xcalak Road, there is a Pemex Gas Station. We recommend you top up your gas, and then go back to the Xcalak Road and turn left towards Xcalak. Note: There is no Pemex Station in Xcalak. This 61 km highway is an excellent road, with some curves. Enjoy the encroaching jungle. Drive carefully and watch for wildlife. Stop at the T Junction and turn left. 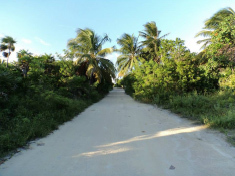 Drive 2 kilometers into Xcalak Village, and drive through the village all the way to the ocean. Turn left (North) at the ocean. You are now on the original Beach Road. Keep the ocean on your right, go past the town dock and lighthouse. Just beyond the Military base, turn left, then take your first right (you’ll see our sign). Go over the bridge and drive North for 8 km (5 miles). 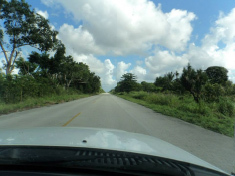 DRIVING FROM MERIDA OR CHETUMAL? Just ask us to email you Travel Instructions from these 2 cities. We are happy to help. All rates listed are Double Rates. #2: Accommodates 1 to 3 people. #4 and #5: Accommodate 1 to 2 people. Accommodate 2 to 5 people. Hi Stewart. Thank you so much for including Sin Duda Villas in your wonderful and informative blog. You are very generous! We appreciate.